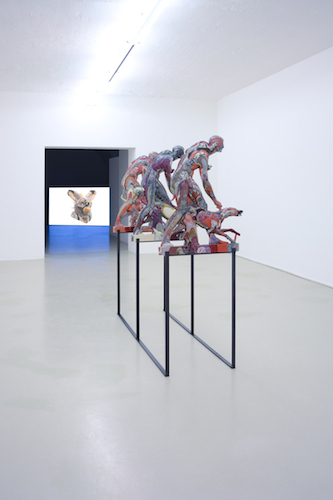 View of “Oliver Laric,” 2014–15. Foreground: The Hunter and His Dog, 2014. Background: Untitled, 2014. Appropriation, copy, variation, dissemination: Oliver Laric’s work hinges on these fashionable concepts. What distinguishes his output from other “post-Internet” artists is the way in which he also investigates similar notions beyond the present, establishing fascinating conceptual parallels between, for example, the reprocessing an image undergoes when it is put out on the Web and the evolution of Greek and Roman sculpture, where both, to different extents, are the result of collective and anonymous processes. The two works exhibited in this show confirm this approach and cover a broad chronological and cultural spectrum. The Hunter and His Dog (all works 2014) is a grouping of three synthetic-resin sculptures that reprise a neoclassical statue by John Gibson with the same title. Beginning with a 3-D scan of the original piece, Laric created a bas-relief on a smaller scale, presented in three chromatic variations. The elegant veining of the resin was achieved using a process similar to that for decorative faux marble, an artisan technique that Laric intentionally contrasts with the fetishized individual touch of the artist/author in a modern sense. The second work in the exhibition, Untitled, is a video based on fragments of animated films from different periods, where one character metamorphoses into another character, an animal, or an object. The artist has had film clips redesigned to highlight the intermediary stage between one identity and the other, before adding brief ad hoc digital animations. What thematically links the two works on view is our relationship with the “other,” particularly animals (the young naked athlete of Gibson’s statue holds a dog by the collar). Notably, the philosopher Rosi Braidotti explores this theme in a text made available to viewers as a corollary to the show.